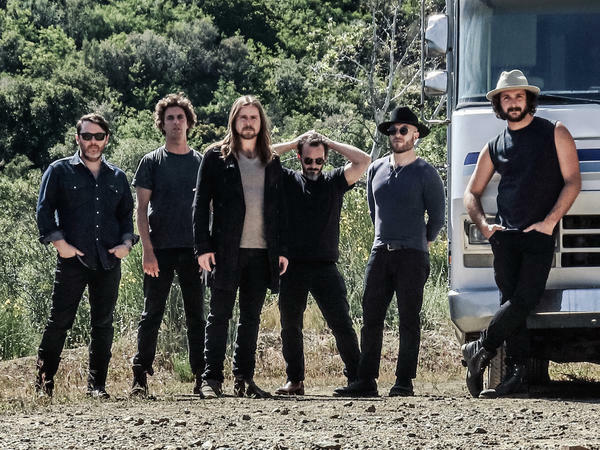 Lukas Nelson and Promise of the Real's new, self-titled album was released August 25. Lukas Nelson and Promise of the Real. As the son of the outlaw poet Willie Nelson, Lukas Nelson has a name that opens doors. But he's put in the work, too, spending years on tour with Neil Young and playing gigs with the musician who happens to be his father. Most importantly, he's been making time for his own music with his band, Promise of the Real — their new, self-titled album was released on Friday. Nelson talked to NPR's Scott Simon about the origin of his band, his childhood in Hawaii (and on the road) and the love story behind his song "(Forget About) Georgia." Hear their conversation at the audio link and read an edited transcript below. Scott Simon: How did your band, Promise of the Real, come about, and what inspired the band name? Lukas Nelson: I met my drummer, who I started with the band with — his name's Anthony Logerfo — we met at a Neil Young concert. And we loved each other's vibe, and we love Neil, so we decided to start a band together that night, really. We actually went surfing under the pier at midnight with a bunch of his friends. So first thing that happens to me is my first step in the water, I step on a stingray and it whips around and stings me in the ankle. And I'm like, "Oh my God!" But I didn't wanna tell them because I didn't want to seem like I was chickening out. So I ended up surfing for a couple hours with my ankle just throbbing. And then finally, it kind of got too much, and I told the guys what had happened and they were like, "Oh my God! There are so many stingrays around here, of course we would've believed you!" Anthony brought this pile of weed that looked two feet high to me at the time, and he was like, "Here, just listen to Neil and we'll roll this up." And one of the first songs we put on... was called "Walk On" by Neil Young. And the line is "Some get stoned / some get strange / but sooner or later it all gets real." So I started a band called Promise of the Real after that song. Wow. What a night. As you say, you grew in Hawaii. So where'd you get that Texas accent? Well, I'm born here in Austin. But my dad's had a place in Hawaii since, like, '78. And my mom thought it would be kind of a nice place to really raise me, along with Austin, going back and forth. Because here in Austin, dad's got this — people think he's just the king, and she didn't want me growing up thinking I was a prince. I really appreciate that. And you were on the road from the age of 13. Dad used to have my brother and I both on stage, even when we were little tykes playing percussion. I remember I had a dream when I was six years old, and I was onstage, and I was terrified. I wanted to sing but I was terrified of singing. And something told me to shrink all of my conscious awareness into my chest. And I started singing from that place, and the crowd went wild. After that dream I was never afraid to be on stage and sing, and I didn't realize until way later in life that that dream was kind of a vision, and it was like a metaphor: If you're ever fearful, go into your heart and come from that place, and that will alleviate the fear. Speaking of your heart, I wanted to ask you about one of the songs on your album, "(Forget About) Georgia." It's a heartbreaker. Yeah. I met this girl named Georgia in San Francisco. I fell in love with her and we were never really together, but it was kind of this romantic back-and-forth for a while. It was a heartbreak and I learned a lot and I grew a lot from this relationship. But then after, you go on tour with your father and what song do you sing every night? "Georgia On My Mind." Yeah, I have to sing her name every night, because her name's Georgia. You know, I had to tell myself — I wonder if I fell in love with her because her name is Georgia. I don't know. This beautiful girl, this name's Georgia, I've been listening to that my whole life. I wonder. But no, she was real special. So it was really hard to forget about her and it made it doubly hard because I had to go out, sing that song every night with dad. And you know, interestingly enough, full circle — I was singing this song live at a festival and I hadn't spoken to her in months and years... All of a sudden, as I'm playing, like a dream, I see her walking up. We lock eyes... I mean, I'm getting chills just thinking about it, because she just appeared out of nowhere. And I sang the whole song to her, just right there onstage. And then I didn't see her afterwards. She was just this vision. And then I ended up reaching out and we talked. It was quite an event; that was just a few months ago. So she knows about the song. Oh yeah, she loves it. Of course she would! [Laughs.] So, you like being on the road? I love being on the road. It keeps me present. Because I'm not allowing my brain to get into any sort of pattern, where I start worrying about things that don't matter. If I'm in a new place every day, I have to be alert. I'm forced to be in the present moment so I can take what comes. It can be hard on relationships though, right? It can, but in a way it filters out the fluff. I mean, I grew up learning how to love somebody from afar. I grew up realizing that you don't need to be around somebody physically to trust and love them, in order for them to have your back and you have theirs. 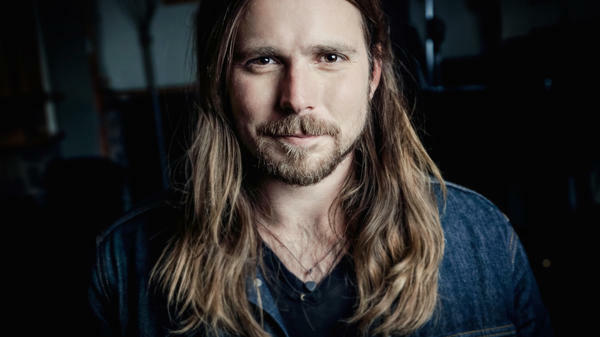 Lukas Nelson has a name that opens doors. He is the son of the outlaw poet Willie Nelson. But he's put in his own work, too, spending years on tour with Neil Young, doing gigs with the musician who happens to be his father and still making time for his own music, like this from his new album "Lukas Nelson & Promise Of The Real." LUKAS NELSON AND PROMISE OF THE REAL: (Singing) I'm sitting in a room waiting on an answer and hoping that the lord sees fit to let me leave. If the news ain't good, you ain't coming back. SIMON: That's "Set Me Down On A Cloud" from Lukas Nelson's new album. He joins us now from our friends at member station KUT in Austin. Thanks so much for being with us. LUKAS NELSON: Hey, thanks for having me. SIMON: And where's your band's name come from, Promise Of The Real? NELSON: I met my drummer, who I started the band with. His name is Anthony Logerfo. And we met at a Neil Young concert. And we loved each other's vibe. And we loved Neil so much that we decided to start a band together that night, really. Actually, we went surfing under the pier at midnight with a bunch of his friends. So first thing that happens to me is my first step in the water, I step on a stingray. And it whips around and stings me in the ankle. And I was like, oh, my God. But I didn't want to tell them because I didn't want to seem like I was chickening out. So I ended up surfing for like a couple hours with my ankle just throbbing. And then finally, it kind of got too much. And I told the guys what had happened. And they were like, oh, my God. There's so many stingrays around here. Of course, we would have believed you. And then Anthony brought this pile of weed that was like 2 feet high it looked like to me at the time. And he's like, here, just listen to Neil and we'll roll this up. And one of the songs - the first song he put on, he's like, remember this song? And it's called "Walk On" by Neil Young. And the line is, some get stoned, some get strange, sooner or later it all gets real. NEIL YOUNG: (Singing) It all gets real. Walk on. Walk on. NELSON: And so I started the band called Promise Of The Real after that song there with Neil. SIMON: Wow, what a night. As you say, you grew up in Hawaii. SIMON: So where'd you get that Texas accent? NELSON: Well, I'm born here in Austin. But my dad's had a place in Hawaii since the - like '78. And my mom thought that it would be kind of a nice place to really raise me along with Austin, going back and forth, because here in Austin, dad's got this kind of, you know, vibe. People think he's just the king. And she didn't want me growing up thinking I was a prince, you know? I really appreciate that. SIMON: And you were on the road from the age of 13, I gather? NELSON: Dad used to have us - my brother and I - both on stage even when we were a little tykes playing percussion, you know? I remember I had a dream when I was like 6 years old. And I was on stage, and I was terrified. I wanted to sing, but I was terrified to sing. And something told me to shrink all of my conscious awareness into my chest. And I started singing from that place. And the crowd went wild. And after that dream, I was never afraid to be on stage and sing. And I didn't realize until way later in life that that dream was kind of a vision. And it was like a metaphor to, like, always if you - if you're ever fearful, just go into your heart and come from that place in whatever you're doing and that will alleviate the fear. SIMON: Well, speaking of your heart, I want to ask you about one of your songs on this album. And it's a heartbreaker. Let's hear a little bit of "Forget About Georgia." LUKAS NELSON AND PROMISE OF THE REAL: (Singing) And then when she told me her name, I knew I would die slowly. I knew I was destined to live with this pain every night for each night I stand with my father playing our music. We cry out her name and her memory under the lights. SIMON: So you met this girl named Georgia. NELSON: Yeah. I met this girl named Georgia in San Francisco. And so I fell in love with her, you know? And we were never really together. But it was just kind of this romantic back and forth for a while. And it was a heartbreak. And I learned a lot, you know? And I grew a lot from that relationship. SIMON: But then you have to - you go on tour with your father. And what song do you have to sing every night? NELSON: Yeah. And I have to sing her name every night because her name's Georgia. And, you know, I had to tell myself, I wonder if I just fell in love with her because her name was Georgia. I don't know. It just seemed like just a beautiful girl and her name was Georgia. And I've been listening to that my whole life, I wonder. But no, she was real special. And so it was really hard to forget about her. And it made it doubly hard because I had to go out sing that song every night with dad. WILLIE NELSON: (Singing) Just an old sweet song keeps Georgia on my mind. NELSON: And, you know, interestingly enough, full circle, I was singing this song live at a festival. And I was - I didn't - I hadn't spoken to her in months and years. And I was playing the beginning of it. And all of a sudden, as I'm playing it, like a dream, I see her walking up. And we lock eyes. And she comes and she starts - I mean, I'm getting chills just thinking about it because she just appeared out of nowhere. And I sang the whole song to her just right there on stage. And then I didn't see her afterward. It was just this vision. And then I ended up reaching out. And we talked and said, hey, you know? But it was quite an event and that was just a few months ago. SIMON: So she - I mean, she knows about the song then? NELSON: Oh, yeah. She loves it. SIMON: (Laughter) I guess she would. LUKAS NELSON AND PROMISE OF THE REAL: (Singing) A part of me hopes that she will never forget about me. SIMON: Well, you like being on the road? NELSON: I love being on the road. It keeps me present because I'm not allowing my brain to get into any sort of pattern or start worrying about things that don't matter. Like, if I'm in a new place every day, I kind of have to be alert. And I'm kind of forced to stay in the present moment so that I can take what comes, you know? SIMON: It can be hard on relationships, though, right? NELSON: It can. But it also, in a way, it filters out the fluff. I mean, I grew up learning how to love somebody from afar. I grew up realizing that you don't need to be around somebody physically in order to trust and love them and in order for them to have your back and you have theirs. SIMON: Lukas Nelson, his new album "Lukas Nelson & Promise Of The Real." Thanks very much for being with us. NELSON: Hey, thank you. It's been great. (LUKAS NELSON AND PROMISE OF THE REAL'S "FIND YOURSELF") Transcript provided by NPR, Copyright NPR.